This is Day 1 of 31 Days to Start a Freelancing Business (Or Make Yours A Better One). Every day, we will focus on a specific task you should carry out in order to start a profitable freelancing business. Even though this series lasts 31 days, feel free to go at your own pace. And if you’re already freelancing, it still helps to go through these tasks again. You’ll find ways to improve and make your existing freelancing business even more profitable and more enjoyable than it is. I’ll be doing it with you! So you’ve decided to start freelancing. Congratulations! It’s a leap of faith, whether you were thrust into it by a lay-off, or it’s a dream you’ve had for years. Either way, it pays to start right. And let’s begin with YOU. Begin by making a list of all your skills. 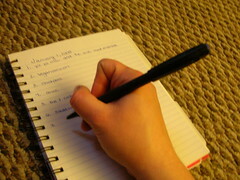 Grab a big, blank sheet of paper and a pen or pencil and just list down each and every thing you can do.